Lockett Technologies, Inc.: CreoPop Is The World's First 3D Pen With Cool UV Ink. CreoPop Is The World's First 3D Pen With Cool UV Ink. 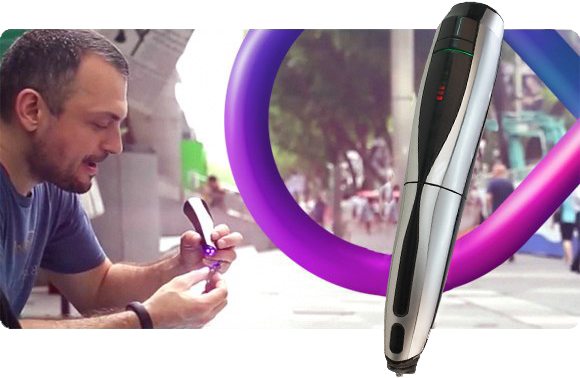 CreoPop (www.creopop.com) is the world’s first 3D pen with cool ink. In contrast to other 3D pens, there are no hot parts, no melting plastic and no unpleasant smell. Instead, CreoPop uses photopolymers that are solidified using LED diodes to let users create amazing 3D designs. Since no heating is required, CreoPop is safe in a home environment with children and pets around. The most innovative feature of CreoPop is the large selection of cool inks available including different colors, elastic ink, magnetic ink, glow-in-the-dark ink, temperature sensitive ink and body paint ink. CreoPop completed its crowdfunding campaign on Indiegogo in August 2014 raising USD 185,690 (464% funded). CreoPop is now part of Indiegogo’s “Funding Forever” scheme which allows us to continue to accept pledges on Indiegogo. You can pledge for pens right here and then order additional ink on www.creopop.com. Unlike other 3D pens there are no hot parts, no melting plastics and no unpleasant smell. Instead, CreoPop uses photopolymers that are solidified using UV light to let you focus on creating designs rather than being worried about burning your fingers.